Sarah Brandt's family is one of the oldest in New York City, and her father, Felix Decker, takes his position in society very seriously. He still refuses to resign himself to his daughter being involved with an Irish Catholic police detective. But when a member of his private club the very exclusive Knickerbocker is murdered, Decker forms an uneasy alliance with Detective Sergeant Frank Malloy to solve the crime as discreetly as possible. Malloy soon discovers that despite his social standing, the deceased Chilton Devries was no gentleman. In fact, he's left behind his own unofficial club of sorts, populated by everyone who despised him. As he and Sarah sort through the suspects, it becomes clear to her that her father is evaluating more than the detective's investigative abilities, and that, on a personal level, there is much more at stake for Malloy than discovering who revoked Devries membership permanently. Victoria Thompson is the Edgar(r) Award-nominated author of the Gaslight mystery series and 20 additional historical novels. She lives in Western Pennsylvania with her family. "Victoria Thompson SHINES...Anne Perry and Caleb Carr fans, rejoice!" 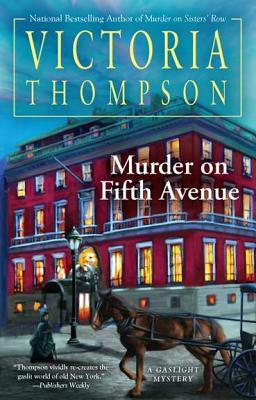 "Thompson's Gaslight Mystery series provides a fascinating window into a bygone era." "Victoria Thompson has a knack for putting the reader inside her characters' heads and...[brings] the setting vividly to life."